It began with a 15-year-old girl. 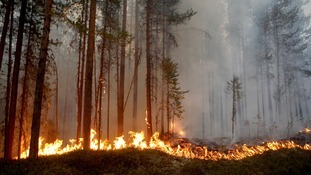 Sweden had sweltered through its hottest summer since records began, suffering drought and dozens of wildfires. And schoolgirl Greta Thunberg became angry. Towards the end of August last year, she decided she would not be returning to school. Instead, every day in run-up to the country's elections on September 9, she sat quietly on her own outside Parliament with a sign which read: "School strike for the climate." "What am I going to learn in school? Facts don’t matter any more," she told The Guardian. "Politicians aren’t listening to the scientists, so why should I learn?" The solo protest soon captured the imagination of others, who joined her sitting peacefully on the ground. And then the rest of the world began to take notice. Now 16, Greta has addressed the UN Climate Change COP 24 conference in Poland, and spoken to March for Climate protesters outside. She also gave a speech at the World Economic Forum summit in Davos, Switzerland, in January - warning delegates from around the world to act as if the "house was on fire. Because it is." 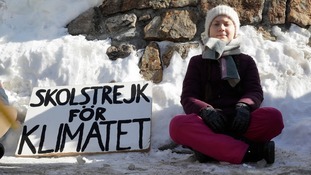 She has continued her protest every Friday since September - and there has been a wave of action around the world in response, under a campaign known by the hashtag #fridaysforfuture. Up to 70,000 schoolchildren from almost 300 towns and cities worldwide are thought to be taking part in demonstrations and strikes each week. In Belgium, thousands of students have skipped school for six weeks running, demanding action from leaders. 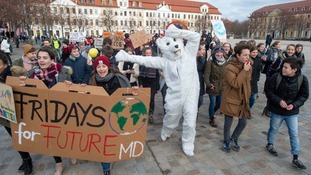 Their latest protest, on Valentine's Day, saw teenagers take to the streets with banners calling "Time's Up" and "Act Now". They've been joined by others in Germany, who have held a number of protests in recent weeks too. And now students across the UK have joined in. Among those taking to the streets on February 15 was 11-year-old Scarlett Hughes, from Exeter. She told ITV News she wants the government to lower the voting age to 16 to allow her to have a say in her own future. "We can't just leave it to the adults because clearly, they can't sort things out," she said. Organisers said school strikes had been planned in more than 60 areas across the country, stretching from Cornwall right up to the Scottish Highlands.